I love going to our neighborhood Farmer’s Market, exploring all the delicious, locally grown fruits and vegetables. This week our Farmer’s Market had locally grown strawberries and rhubarb. 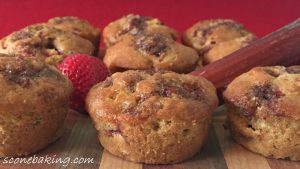 With my fresh, locally grown strawberries and rhubarb in hand, I’m sharing with you my YouTube video demonstrating how to make my Strawberry-Rhubarb Muffins. I hope this recipe and the YouTube video demonstration (see link below) inspires you to bake.